Weitas Creek Click on the image to enlarge and zoom in. At 260,000 acres Bighorn – Weitas (Weitas Creek), is the largest Roadless Area entirely within the Nez Perce – Clearwater National Forests. This swath of natural beauty sits within two major drainages: Weitas Creek and Cayuse Creek, with various streams that drain into the North Fork Clearwater. The area between Weitas and Cayuse Creeks (Cook Mountain) consists of generally rolling upland landforms with wide ridges and pleasant scenic views. Underlying coarse-grained quartz menzonite of the Cretaceous Idaho Batholith, coupled with gneiss and rhyolite, created highly erosive soils here. However, there are few large, exposed areas of rocky and barren ground. Mountaintops are mostly rounded and deeply weathered. Weitas Creek lies dominantly in the cedar-hemlock-pine ecosystem. At the higher elevations, roughly 5,000 – 7,000 feet, one finds spindly carex and beargrass, and mountain hemlock and even-aged lodgepole pine, their slender trunks shooting upwards in defiance of the forest fires that induced their growth. At lower elevations, ranging from 2,400 – 4,000 feet at the stream bottoms, grand fir and Western red cedar dominate. Within the conifer stands stretch large brush fields and grass meadows used as winter forage by ungulates. Wildlife abounds in this sprawling low-elevation country. Roughly 18,000 acres provides crucial winter range for elk. Mule deer and black bear are other common big game, as well as moose, mountain lion, the threatened lynx, wolverine, fisher, wolves, and the intriguing, yet unconfirmed, grizzly sighting. In addition, numerous Region 1 sensitive species’ habitats occur here. The cold, clear waters of the creeks provide a haven for Bull trout and cutthroat trout. A Cayuse Creek catch-and-release regulation established in 1974 for the protection and enhancement of the latter species resulted in a regional reputation for an excellent fishery. The region also contains significant historical and cultural features. Of particular interest is the Lolo Trail, which is on both the National Historic Landmark and National Historic Trail registries. Long a fundamental prehistoric route between the Columbia Basin and Montana country, the trail was also utilized by Lewis & Clark. Later, the Nez Perce leader Chief Joseph and the band of non-treaty Indians traveled the trail to Canada, attempting to escape persecution during the Nez Perce Conflict of 1877. In addition to this landmark, nine other prehistoric sites and fifty-seven historical sites have been located just outside or in some cases within the region including Forest Service lookouts, cabins, and Lewis & Clark expedition campsites, among others. Opportunities for hiking, backpacking, primitive camping, horseback riding, hunting, and stream fishing are abundantly provided. Among the wide, rounded ridges of the drainages and tributaries visitors will find solitude and a sense of isolation in the verdant wild. Diverse topography and expanses of dense trees and shrubs shield the explorer from outside activities. Weitas Creek provides clean water for the North Fork Clearwater, and Upper Cayuse Creek. 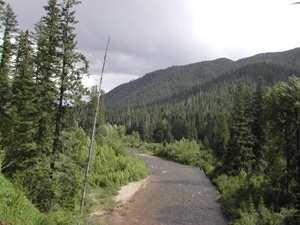 These North Fork tributaries contain some of the largest stands of old growth left in the entire Clearwater Basin (generally low-elevation river valleys such as this do not escape road building/development). The Forest Service suggested if this area is designated as Wilderness, the unmaintained 555 route beyond the Weitas Guard Station bridge be incorporated in the Wilderness. That is precisely what our proposal does. Under the Clearwater National Forest Travel Plan (2012) Weitas Creek was turned over to off-road motorized use, threatening to exacerbate erosion-prone soils, displace wildlife, and disturb the primitive serenity. It is for these fundamental attributes, as well as the protection of unparalleled fish populations and wildlife habitats that make the Bighorn – Weitas region a vital candidate for wilderness designation. Friends of the Clearwater would like to thank University of Idaho Professor Emeritus Dr. Fred Rabe for his work on the Weitas Creek Roadless Area booklet. 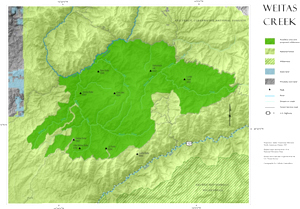 Descriptions of other Roadless Areas on the Nez – Perce Clearwater National Forests that qualify for Wilderness.